Rosemary is native to the Mediterranean area, where it grows wild and in huge masses on rocky hillsides near the sea where the soil is dry and chalky with lots of sunshine. It has been in use in that part of the world since 500 B.C, now we find it throughout Europe and in the U.S. The name is derived from the Latin “ros” and “marinus,” meaning “dew of the sea.” This shrub/herb can grow up to six feet tall along the Mediterranean coast. Originally it was used for medicinal purposes, especially among the ancient Greeks when they intertwined branches in their hair to guard against “weakness of the brain” especially at a time while taking exams, and was thought to cure ailments of the nervous system. As folklore tells us it carries many superstitions and is a member of the Mint family. Through the ages rosemary was tossed into graves at funerals, as a sign that the deceased would always be remembered. Shakespeare tells us in Hamlet: “There’s Rosemary, that’s for Remembrance.” Rosemary also symbolizes fidelity, from the time of Anne of Cleves who wore a rosemary wreath when she embarked on her ill-fated marriage to Henry VIII. Rosemary is a very aromatic shrub with numerous branches that grow low to the ground when young and later becomes woody with grayish-brown, scaly bark. The narrow, leathery leaves are spiky, with a dark green upper surface and a pale gray, underside. The silver-green, needle-shaped leaves are highly aromatic and their flavor hints of both lemon and pine. Its small blossoms are pale blue and sometimes pale pink and are a special delicacy to bees. In the markets today this herb is available fresh, in whole-leaf form, as well as dried and powdered. In your gardens, harvest Rosemary from midsummer through late fall. 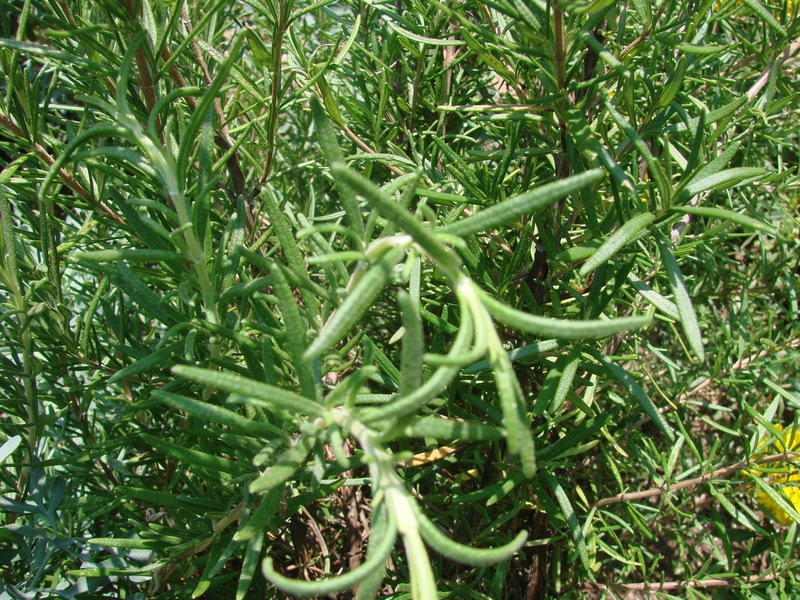 Rosemary can be used as a seasoning in variety of dishes including fruit salads, soups, vegetables, meat, particularly lamb, fish, egg dishes, stuffings , and dressings. Also, one cannot overlook the many possibilities in breads and muffins. Shallow diagonal crisscross cuts on both sides of the steak so that the steak is scored in a diamond pattern. This scoring will both tenderize the steak and prevent curling during cooking. Place the scored steak in a shallow non-reactive dish. Combine remaining ingredients in a small bowl and pour that mixture over the meat. Allow to marinate at least 1 hour but no more than 3. Turn meat several times while it marinades. Preheat broiler or barbecue grill, then broil or grill the steak quickly about 2-inches from the heat source. Cook the steak for about 8 minutes on the first side and 4 minutes on the second….or altogether less……..if you desire the meat a little rare in the center. The real secret to a tender flank steak is the carving. Position the cooked meat on a carving board so that the smallest end is angled slightly away from you. Secure the meat with a fork or tongs and, with the blade of your knife almost parallel to the surface of the steak, make very thin slices diagonally across the grain of the meat. You can make a delicious sauce with the remaining marinade by straining it and placing the liquid in a small saucepan over medium heat. Combine 1 Tbsp Cornstarch with 2 Tbsp Cold Water. Add to the heating marinade, mix well and allow to thicken slightly. Sprinkle in a tad more finely chopped fresh rosemary, mix well and serve over the sliced meat. My personal encounters with the herb – Rosemary ………..
After I graduated from College I found a position as a Medical Research Technologist at the University of Tuebingen in Germany. At the end of my one year contract I found myself with a group of friends vacationing on the Coast of the Adriatic Sea. We were on a Sail Boat hopping the islands in those most beautiful blue waters. The islands were barren of any kind of growth, but Rosemary and Sage. These two herbs grew in such abundance that whole herds of sheep found enough food to sustain their livelihood. As I was gazing at this amazing sight of green and gray bushes, inhaling the powerful aromas of these herbs, watching the energetic sheep munching away in lively exuberance, I could not but think………that their flesh is already marinated before they are slaughtered for human consumption. I remember going to weddings as a child, I saw that when the bride and groom entered the church that they were given a small bouquet of Rosemary that was pinned on them, to assure happiness as long as they live together. When my parents immigrated to the U.S. and when my father bought our second home in Los Angeles, CA, my mother planted a Rosemary bush on the side of our house. This bush grew to be quite large through the years. I graduated from college, spent my three years in Europe and came back to marry my husband within a year and a half of returning. 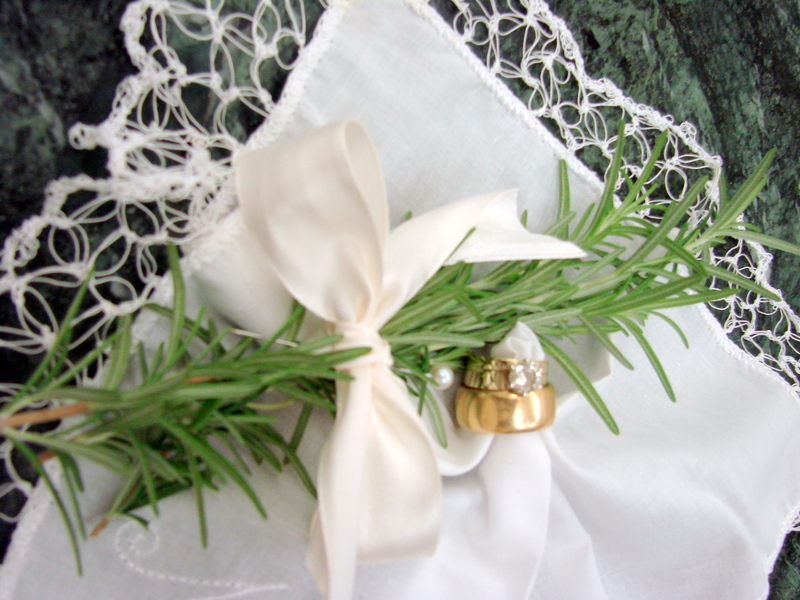 To my biggest surprise and pleasure my mother announced that we would make little buttonière of Rosemary to be pinned on every guest that came to my wedding. We made 160 of these little bouquets and wrapped a little white ribbon around each one of them. During the wedding ceremony the whole church was sitting in an aromatic cloud of Rosemary fragrance. After our honeymoon we visited my parents only to see that the Rosemary bush had died. I think it knew that my mother planted it for a purpose……..and when that purpose was fulfilled…it died! My husband and I are still together after 41 years of marriage. That little twig of Rosemary kept it’s promise! Why do you like this herb, Rosemary…or do you not like it? How do you use it….in cooking, baking, medicinally or therapeutically?